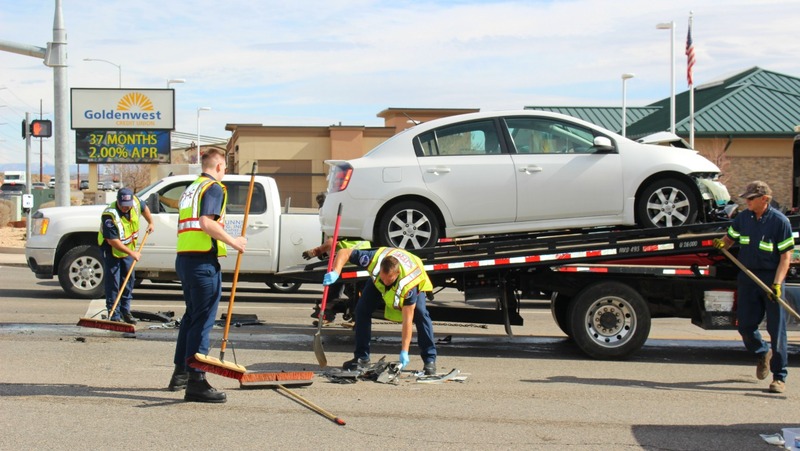 ST. GEORGE — A two-vehicle crash at a busy intersection on Riverside Drive was the third crash triggered by a driver failing to yield in less than three hours, which kept responders busy Tuesday morning. Officers and reponders were dispatched to a head-on collision at the intersection of South Mall Drive and East Riverside Drive that involved a blue Ford passenger car and a white Nissan four-door, St. George Police officer Jeremy Needles said. Officers found both vehicles severely damaged in the middle of the intersection blocking traffic. The woman driving the Ford was heading south on Mall Drive, while the Nissan, heading north on the same street, was stopped in the left-turn lane behind a pickup truck to head west on Riverside Drive. As the light turned yellow, the truck pulled out to make the turn and was able to clear the intersection, while the Nissan was struck head-on when the driver pulled directly into the path of the oncoming Ford. Both vehicles were destroyed in the crash, but no serious injuries were reported and no one was transported to the hospital. The woman driving the Nissan was later cited for failing to yield on a left turn. “This is the third one and while we were here another one came in,” St. George Police officer Lona Trombley said. She added that crashes involving failing to yield have increased, as have all crashes. There have been 410 crashes reported so far this year, up from 373 crashes during the same period in 2016. Additionally, 77 of the crashes this year were caused by drivers failing to yield on a left turn, which accounts for 19 percent of all crashes within the city, making it the most common cause of crashes. In Utah, failing to yield on a left turn contributed to nearly 13 percent of all fatal crashes in 2017. From 2012-2016, it contributed to 154 traffic deaths, according to Utah Department of Public Safety data. 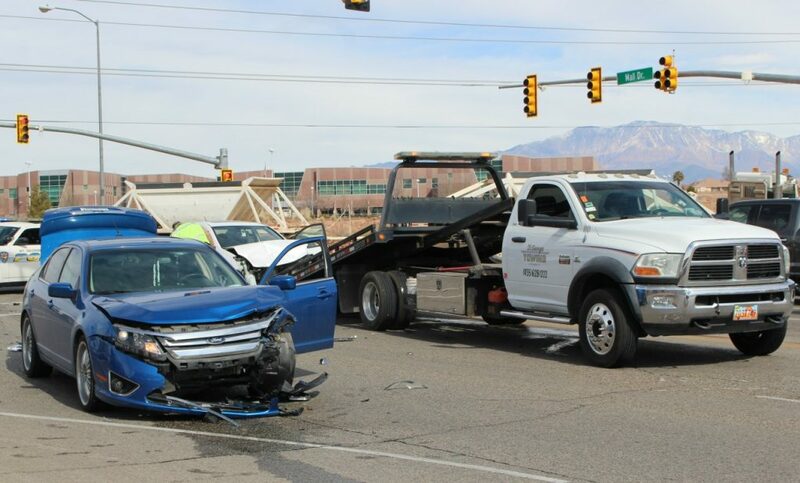 Utah’s numbers are higher than national numbers, which show that 7 percent of all fatal crashes in 2015 involved a driver failing to yield on a left turn, according to the most recent data available from the Insurance Information Institute. Well here’s a thought, and I’m just spitballing here, but maybe, just maybe, it’s too difficult to turn left in this town. I envision the guy who created the St. George traffic grid. “I’m not an ambi-turner,” he reluctantly admits to his spouse as he bitterly constructs a town-wide scenario in which everyone else must share his handicap. Fixing this problem is so simple it really makes me wonder if our leaders are capable of abstract thought. The flashing yellow left turn signals are big fat losers. I’ve never seen it anywhere else, which isn’t to say it doesn’t exist elsewhere, but it’s new to me. And it plain and simple doesn’t work in the big picture. I can’t count the number of times I’ve had to wait through two or three cycles of red lights around here because, while the red light seems to feel the flashing yellow light is all I need to make my left turn, the traffic disagrees. Is it really any wonder that people around here take ANY opportunity to turn left, even very questionable opportunities? Here’s a tip, St. George: Green turning arrows. They’ve been using them for decades in other parts of the country, and ambi-turners and non-ambi-turners all agree that they are high-functional, and seem to prevent the kind of scenarios in which desperate people make desperate turns simply because there doesn’t seem to be any other choice. When I moved from Salt Lake County 10 years ago this was a rampant problem — cars running yellow and hitting cars turning across the lane (left) during yellow. Utahans must have a turn-left arrow only — not an arrow followed by a green light. Solid green both ways creates chaos. The flashing Yellow Arrow is Utah’s IQ test for drivers. STG News has shown there are many who fail that test every day. Nothing wrong with flashing arrow, gives cars a chance to turn left when traffic is light instead of waiting for a designated green only left turn.